Apple has unexpectedly shipped an update to watchOS bringing it to version 5.1.1, a release of the wearable operating system that seems to solve a recent issue that bricked some models of Apple Watch. Apple Watch Series 4 displaying Apple's new Infograph watch face. 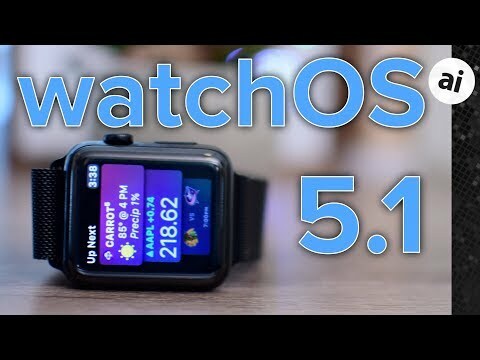 The new watchOS 5.1.1 replaces version 5.1, following reports some users attempting to install the release discovered their devices had bricked. Users were able to download the update and begin the installation, but the process froze at the Apple Logo, with it remaining onscreen for hours. The complaints caused Apple to pull the release the same day. While not all users were affected, those with non-functional devices had to contact Apple to obtain a replacement. It is unlikely that the bricked Apple Watch models would be able to install the new update without Apple's intervention. The watchOS 5.1.1 release is notable as it did not enter into any publicly-visible beta process before its release. Apple's other operating systems have restarted the beta testing cycle for new versions, including iOS 12.1.1, tvOS 12.1.1, and macOS Mojave 10.14.2, with watchOS now the only one of the four not to be undergoing the beta process. Initially issued on October 30, the release of watchOS 5.1 introduced a number of bug fixes and other minor improvements, including support for Group FaceTime calls via audio, new emoji, and new watchface customization options. So if my Gen4 Apple Watch upgraded to watchOS 5.1 fine, should I even bother to update to watchOS 5.1.1 (if there are no changes)? Best to wait a week. As always. I have a Series 4 that was bricked during the 5.1 updates, had to send it off to Apple to get an OS installed again from what I was told. I'm wondering if they will install the 5.1.1 update before sending the watches back. In my feedback to Apple, I said that the Watch remains the only IOS devices that we can't do a rollback. I'm hoping this will change for the watch or at least be able to take it to an Apple Store to do a restore. This happened Tuesday evening so going on 7 days tomorrow with no watch. In the words of Brain Tong "Bad Apple"
I really hope they address this. I had my series 2 bricked with a beta several months back. (I’m a developer) It was a near identical situation. After talking with a mgr, they agreed to replace at no cost out of warranty since it was their fault. I got lucky on the 5.1 upgrade on my series 4, but I’m massively paranoid now. I reboot my devices prior to upgrade, make sure iPhone is upgraded first always, and when I do the watch uprgrade, I keep my phone right next to the watch. Probably overkill, but I don’t want another brick. I love the "unexpectedly" in the article, what is to be unexpected? Apple releases 5.1, it has an unfortunate issue, and they pull it, they are going to release a fixed version eventually, and it would be highly unlikely that they would use the same version #.. Thus 5.1.1... So unless I see more reports of watches dying in the next 24 hours, I'll upgrade tomorrow.. I didn’t have the problem with my Series 4 but updated it anyway. All is fine. If the update shows up for you (and you’re already on 5.1 and it’s working fine), then go ahead and update. Apple often uses these sorts of “fix a bug” releases to throw in some other stuff that didn’t make the original deadline, or new security protections et cetera. Despite the unfortunate incident with 5.1, such a serious bug is actually quite rare — so as a general rule of thumb you should update with the week of an update being released. ...and people wonder what the point of keeping the Lightning jack in iPhones is. watchOS 5.1.1 didn’t fix the issue of missing Activity awards for me. Since Nov. 3 I have not been getting any Longest Move Streak awards despite completing my Move goal every day. On Nov. 4 I didn’t get any of Perfect Week awards (Stand, Exercise, Move and All Activity even though I earned them. The update didn’t make the missing awards reappear. Generally speaking, software quality has been degrading for the past several years. The missing badges is a quality of iOS 12.1 /watchOS 5.1 release. Attempted to install 5.1.1 this morning - after reading the issues with 5.1, I waited for another update. Guess what? My watch is bricked (stays on the white Apple logo screen - even after trying to restart, etc. ), so something was not fixed. There’s a potentially user accessible data port on the watch, which Apple simply hasn’t created an interface for the customer yet. But this doesn’t have to be the case on the iPhone. Remove the Lightning port, and they can still have access via something like the SmartConnector. Also, sometimes a bricked device can’t be reset by the customer even with a usable accessible port. So at a certain point including a port just in case a device gets bricked by a bad update is not really ideal. Update to my previous post -- I let my watch sit all day and 5.1.1. update worked with a restart to my phone and watch. Unfortunately watchOS 5.1.1 installation cannot re-continue installation after it was paused. “Resume downloading to Watch...” button doesn’t work, even though both the watch and iPhone are connected to the same Wi-Fi network and being charged. Hopefully it will be addressed in watchOS 5.1.2.